Stacey Abrams is $200,000 in debt. She's not alone. Stacey Abrams, the Democratic frontrunner in Georgia's governor race, said her struggles with debt "will sound familiar to others who are the first in their families to earn real money." 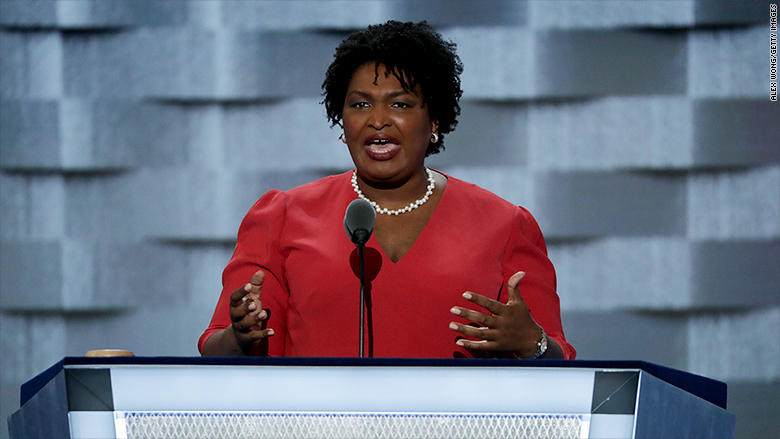 Georgia gubernatorial candidate Stacey Abrams is more than $200,000 in debt. Abrams, 44, wrote an op-ed for Fortune explaining how student loans, cash-strapped parents, and a sibling who struggles with drug addiction contributed to her financial burden. "Once you dig a hole, you're always trying to dig out," she told CNNMoney on Wednesday. "This is something I'm living everyday." Abrams has openly discussed her money troubles before. And financial disclosure forms revealed last month that she owes $50,000 in back taxes and holds $170,000 in credit card and student loan debt. Recent studies show this type of situation is not uncommon. A 2017 survey by Northwestern Mutual suggested three-quarters of Americans are in debt, and their average debt load — not including mortgage debt — is $37,000. About one in ten also said their debt level tops $100,000. Related: Should I take out a loan to pay my debts? Abrams, a member of the Georgia House of Representatives since 2006, is the Democratic frontrunner in the state's governor race. The primary is set for May 22. Her Fortune commentary argues her debt load should not disqualify her. "I suspect my situation will sound familiar to others who are the first in their families to earn real money," Abrams said. She grew up what she describes as "genteel poor." When she got into college, she understood little about managing money or how credit cards worked. Years later, when she graduated from Yale Law School, she was deep in student loan and credit card debt. She says she dug in and managed to pay off her credit cards. But then tragedy struck her family. Hurricane Katrina left her parents in need of financial help. And in 2006, she says they took in the newborn daughter of Abrams' brother, who was addicted to drugs. Abrams was working as lawyer and made decent money. So she did what she could to help, but meanwhile she was sinking deeper into another debt spiral. "No amount of education completely erases how hard it is to catch up," she said. Abrams told CNNMoney that she has spoken openly about her financial and personal troubles because she wants to eliminate the stigma. "Real people have real lives, things happen," she said. She also said her financial experiences helped inform her "economic mobility plan" for Georgia. It would include an earned income tax credit, a family savings program, and a financial literacy effort.